Read our recent statement Israel’s legal warfare on BDS fosters repression and McCarthyism across the world here. Palestinian, Israeli and international human rights defenders are unnerved, but certainly undeterred, by the thinly-veiled threat of physically harming leading BDS activists recently made by Israeli Minister of Intelligence Yisrael Katz. Katz in his statements, made during an anti-BDS conference organized by a right-wing Israeli daily on 28 March 2016, plays on the official Israeli military term for assassination, “targeted thwarting,” and adds “civil” to it. But nothing “civil” can be expected given the prevalence in Israeli society of almost unprecedented racial and violent incitement against the indigenous Palestinians and the popular Israeli cheering of extrajudicial killings. Israeli Minister of Strategic Affairs and anti-BDS czar, Gilad Erdan, also threatened that BDS activists “will start to pay a price,” without revealing any details. In the immediately following sentence, however, he explained that he did not mean any “physical harm” as these are “sensitive times.” Negating his intention to physically harm Palestinian human rights defenders in this particular context almost certainly normalizes the opposite, that it is conceivable, if not probable, in less sensitive times to physically target BDS activists. The seriousness of these threats by Katz and Erdan must be seen in light of increased Israeli lawlessness and criminal impunity. Even Zionist Israeli dissenters who dare to reveal some Israeli war crimes are tainted as “traitors” by Israeli officials. The last time a sitting Israeli prime minister was labelled as such, a fanatic Jewish-Israeli took matters into his own hands and assassinated Yitzhak Rabin. These vile threats must be exposed to the world and presented in the mainstream as part of Israel’s “serious human rights violations,” including “extrajudicial killings,” that US Senator Patrick Leahy has called on the Department of State to investigate. Israel’s regime of occupation, settler-colonialism and apartheid should face international sanctions as sweeping as those that were imposed on another lawless regime—apartheid South Africa. No mafia-like threat from anyone will “thwart” BDS activists from advocating for freedom, justice and equality for the entire Palestinian people, in our homeland and in exile. Israel is losing the battles for hearts and minds internationally, among major trade unions, churches, academic associations, student governments, artists collectives, LGBTQ networks, among others. Both Israel and the BDS movement can detect the Palestinian “South Africa moment” approaching. This is why Israel is resorting to fostering a new McCarthyism, intimidating, bullying and threatening those who criticize its apartheid and occupation and those who take effective nonviolent action to end them. Israel is launching a massive, very well-funded campaign in western countries to delegitimize BDS. The most effective response to Israel’s latest desperate threats against BDS human rights defenders is not to get distracted by them and to intensify academic, cultural, economic and military boycott, divestment and eventually sanctions campaigns against its pariah regime, its complicit institutions and all the banks and corporations that are implicated in it. The only way to “stop BDS” is to end Israel’s regime of oppression, allowing the Palestinian people to exercise its rights under international law, especially the inalienable right to self-determination. The Palestinian people, like all other peoples around the world, cannot and will not accept anything less than our freedom, justice, equality and dignity in our homeland. No colonial threats or oppression can extinguish a people’s passion for freedom and justice. The BNC warmly welcomes Amnesty International’s defence of the right of BDS activists to advocate for Palestinian rights under international law and calls on all international human rights organizations, particularly in the US and Europe, to unequivocally uphold the same right. Glenn Greenwald has described the well-orchestrated series of draconian measures taken in France, the US and the UK, among others, against the BDS movement as the “greatest threat to free speech in the West”. Yet Israel’s exceptionalism in some mainstream quarters in the west remains intact. South African Archbishop Emeritus Desmond Tutu has once likened this singling out of Israel’s regime for unconditional military, political and financial support, not to mention protection from accountability, by the US and other western governments to placing Israel “on a pedestal” above every other state. Many people are afraid to criticize Israel’s policies, Tutu argues, because of the exceptionally intimidating methods used by its lobby. BDS is an inclusive, anti-racist movement that is anchored in the Universal Declaration of Human Rights and is opposed on principle to all forms of racism and discrimination, including anti-Semitism and Islamophobia. The BDS movement is advocating for Israel to be taken off “the pedestal” and held to account like other states committing similar crimes. It is clear that Israel has been lobbying for and is directly behind these deeply worrying anti-democratic attacks that are intended to criminalize the advocacy of Palestinian rights. But they are also part of a growing trend in western countries of eroding civil liberties in the name of ‘security’, and of governments and unaccountable elites concentrating power in their hands and undermining democratic principles. By not only participating in this Israeli anti-BDS fest of hate and violent threats against a nonviolent human rights movement and its main activists but also keeping silent about these threats, the US Administration and the EU have effectively given a tacit green light to Israel to harm human rights defenders engaged in BDS activism. The BNC holds both the US and the EU accountable should Israel make good on its threats and harm human rights defenders who are active in the BDS movement, bodily or otherwise. Like the US government, the EU has always been implicated, albeit to a lesser extent, in enabling and maintaining Israel’s occupation and apartheid. But by sending its Tel Aviv ambassador to join this Israeli war on nonviolent Palestinian, European, Israeli and other human rights defenders it has reached a new low of hypocrisy and complicity. This hypocrisy is further accentuated by the fact that the EU ambassador’s co-panelists in the conference included the fanatic Israeli settler leader Dani Dayan and a retired Israeli colonel accused of responsibility for horrific war crimes in Gaza. Israeli soldiers shot and killed, on Wednesday, a Palestinian mother of two, who was also five months pregnant, and her brother, at the Qalandia terminal, north of occupied Jerusalem. The soldiers fired more than fifteen bullets targeting the woman, and prevented Palestinian medics from approaching the two. 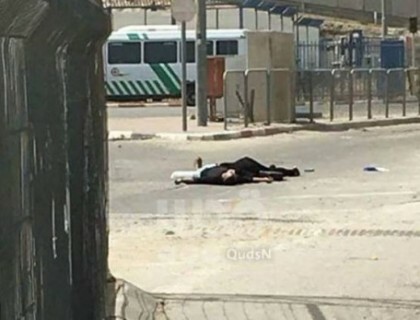 The Palestinian Health Ministry said the slain woman has been identified as Maram Saleh Abu Ismael, 24, from Beit Surik town, north of occupied Jerusalem; five-months pregnant and a mother of two daughters identified as Sarah and Rimas. Her brother, Ibrahim Taha, 16, was killed killed by the soldiers. Eyewitnesses said the soldiers fired a barrage of bullets on the two Palestinians, and left them bleeding on the ground, in addition to preventing Palestinian medics from even approaching them, after declaring the area a closed military zone. They added that the soldiers fired at least twenty rounds on the two Palestinians from a distance, and did not even approach them. The Israeli allegations were refuted by various Palestinian eyewitnesses who said the two did not understand Hebrew, and were trying to reach the roadblock, after the woman obtained a permit to enter Jerusalem, for the first times in Her life. The soldiers later started firing gas bombs and concussion grenades on dozens of Palestinians in the area, in order to force them away. The soldiers also fired many gas bombs on dozens of Palestinian journalists, causing many to suffer the effects of tear gas inhalation. The soldiers were shouting at the pregnant woman and her brother in Hebrew, a language neither of them speaks or understands. Israeli settlers reportedly backed by security forces have stormed the Al-Aqsa mosque in Jerusalem for the fourth time since the beginning of the Passover week. They shouted racist slogans and attempted to conduct religious rituals forbidden at the site. A new string of clashes erupted at the Al-Aqsa mosque, a major holy site for Muslims and Jews, on Wednesday as far-right Israeli settlers under heavy protection from police broke into the mosque, local media reported. Two groups of around 50 men were said to have shouted racist and provocative slogans and attempted to pray although it is forbidden for Jewish people to do so at the site. A number of Israelis and Palestinians were detained for violating the site’s regulations since the first day of Passover. The clashes were first reported on Friday when Israeli settlers stormed the mosque and took a baby goat to the site to carry out a sacrificial ritual. Police managed to prevent the procedure by arresting at least seven people. A number of arrests were also made this week. “Israel Police escorted roughly 1,050 people to the Temple Mount, including 885 tourists and over 100 Israelis, and during the visit 13 were removed from the area for not behaving according to the security measures that were implemented,” said Micky Rosenfeld, a police spokesman, the Jerusalem Post reported on Sunday. “Police also had to move out of the area Palestinians who were chanting ‘Allahu Akhbar’, but no other incidents took place, and no one was injured or arrested,” he said. On Tuesday ultra-nationalist Israelis allegedly beat up the site’s guards and threatened to slaughter them, according to local media. “Israeli settlers stormed Al-Aqsa Mosque this morning under the protection of the Israeli police. They beat the guards and threatened to slaughter them,” spokesman of the Public Relations Department in the Jerusalem Islamic Awqaf Firas Al-Dibs said as quoted by Middle East Monitor. According to the spokesman, the settlers said “we will slaughter you during our festivals instead of goats”. “As Passover approaches, all sorts of extremists will spread lies about our policy concerning the Temple Mount,” he said. On Sunday in a statement given to Petra news agency, Jordan’s Sate Minister for Media Affairs condemned the storming of the Al-Aqsa mosque by Israeli settlers and police, saying that such actions are a violation of international law and will lead to serious consequences. He demanded that Israeli security forces immediately halt such practices and deny entry to Israeli settlers approaching the site, and called for the removal of Israeli security forces from the area. Brazil is in the midst of a prolonged regime change operation, as documented step-by-step by Pepe Escobar in his articles for Sputnik, RT, and the Strategic Culture Foundation. The author’s intent isn’t to get into the situational specifics of each and every detail behind the US’ techniques, but to provide a general overview of the strategies that are at play and their contribution to Hybrid War theory. Brazil is an important New Cold War battleground not just because of its institutional multipolarity, but particularly because of its role in China’s One Belt One Road global vision. The Chinese announced last year that they plan to build the Twin Ocean Railroad between Brazil’s Atlantic Coast and Peru’s Pacific one in order to facilitate transoceanic trade between the two BRICS members by enhancing Brasilia’s transcontinental trade capability. Because this mega project is located in the US’ own hemisphere, the “Monroe Doctrine”-obsessed Exceptionalists accelerated their existing regime change plans for Brazil with the intent of overthrowing its government and replacing it with a pro-unipolar quisling. Many observers are scratching their heads wondering how to properly describe what they’re witnessing in Brazil, and while there’s certainly visible evidence of a Color Revolution, it would be inaccurate to describe it solely through the prism of this definition. At the same token, while it’s beenlikened to a Hybrid War, it only fits the ‘conventional’ informational/economic aspects of this term, too, and doesn’t really satisfy the regime change perquisites of a phased transition from a Color Revolution to an Unconventional War (or at least not yet). Similarly, while there’s definitely a ‘constitutional coup’ going on, it’s also not entirely this form of regime change, either. Rather, there are elements of all three strategies at play, and they interact in a unique dynamic that might represent the unveiling of a new patterned approach that aims to subvert leading multipolar states. What’s important to point out is that the entire plot was set into motion as a result of valuable intelligence that the NSA had gained about Brazil’s top company and later weaponized into a regime change catalyst, meaning that practically every country in the world is potentially vulnerable to this sort of asymmetrical destabilization. The key vehicle in exerting pressure on President Rousseff isn’t the Color Revolution movement, itself an outgrowth of the “Cashmere Revolution” and the return of which the author warned about last summer , but the ‘constitutional coup’ attempts that are being orchestrated to remove her from power. It’s worthwhile to remember that these are built upon an “anti-corruption” investigation that, as Pepe Escobar has repeatedly pointed out, are one-sided and only target the ruling party. It was revealed in September 2013 as part of the Snowden Leaks that the NSA had been spying on Petrobras , the company at the heart of the ‘constitutional coup’ scandal, which in turn raises the possibility that the US had obtained ‘compromising’ information on the alleged corruption activities of key ruling party executives and was waiting for the right time to weaponized it. It shouldn’t be seen as coincidental that the “Car Wash” ‘anti-corruption’ investigation began nearly half a year later in March 2014, which was the run-up to the 6th BRICS Summit in Fortaleza, Brazil that summer. During that major international event, the multipolar leaders committed themselves to creating the alternative financial architecture that would later become known as the BRICS/New Development Bank and officially instituted one year later in Ufa. At the time, “Car Wash” wasn’t big enough to derail any of this, but it also wasn’t meant to be an immediate bombshell. Instead, it can be conceived of as a ticking time bomb that was preplanned to go off at a future date, whether or not Rousseff would have even remained in office by that time. The reader should remember that shebarely won reelection that fall, and if she hadn’t, then it would have been the “opposition” that could have been implicated or discretely blackmailed with the threat thereof. After all, “Car Wash” is a one-sided anti-corruption scandal that purposely neglects targeting any opposition parties and is aimed solely at the ruling class, regardless of whichever one they might have been. 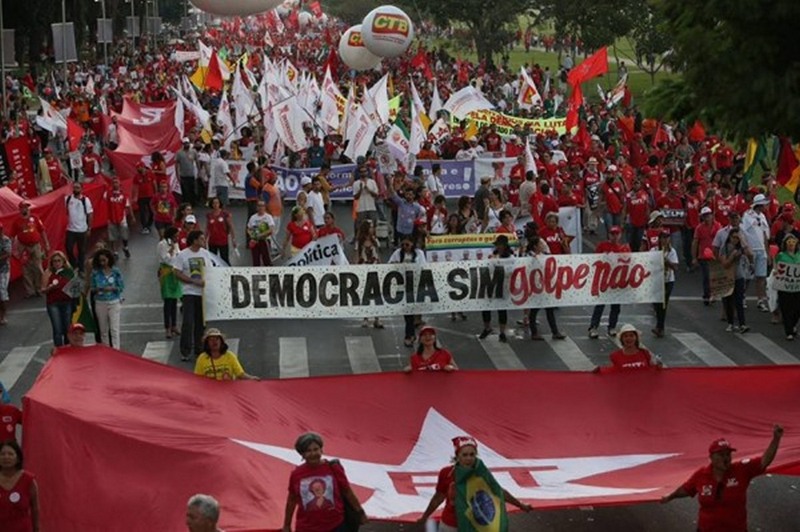 In the case of Rousseff and her Worker’s Party, they’re targeted for regime change, whereas the Brazilian Social Democracy Party of her 2014 election rival would have been targeted for blackmail in order to keep it in line with American strategic precepts for the country. One way or another, after having initiated the ‘Car Wash” inquisition, the US was going to exploit it however it could in order to attain and then maintain its hold on power over the Brazilian political establishment. With Rousseff winning reelection while the investigation was still ongoing and nowhere near ‘conclusively’ finished, it was inevitable in hindsight that it would be used as a weapon for toppling her government and initiating a ‘constitutional coup’. Once Rousseff was implicated (most ‘convincingly’ in the court of public opinion) for her alleged involved in “Car Wash”, the embedded pro-American regime change elements in Brazil’s government sprang into action in initiating the ‘constitutional coup’ proceedings against her. By itself and nakedly presented as a one-sided ‘anti-corruption’ inquisition, the ‘constitutional coup’ had no semblance whatsoever of domestic or international ‘legitimacy’, which necessitated a dramatic move in order to ‘justify’ it. This was the role that the nascent Color Revolution ended up playing, since without tens of thousands of people in the street, there could be no pretense of ‘democracy being served’ by her indictment. Instead, the US’ hand in all of this would be even more obvious than during Latin America’s last ‘constitutional coup’ in 2012 Paraguay. Additionally, Brazil isn’t Paraguay – it’s a leading multipolar power and a nation many times larger than its landlocked neighbor, and carrying out a regime change there requires more ‘finesse’ and ‘public relations’ manipulation in Brazil than it ever would in Paraguay. Therefore, the Color Revolution itself is inconsequential in pressuring Rousseff’s government or enacting any leadership concessions from her whatsoever. The entire regime change operation against her is driven by the ‘constitutional coup’, which itself is being disguised by the Color Revolution that has attracted the ‘normative’ attention of most of the world’s pro-unipolar media. This can be proven by the copious media coverage given to the thousands of people who are protesting against her and rallying around a giant inflatable yellow duck compared to the considerable lack of attention being given to the NSA’s role in catalyzing the entire Petrobras ‘anti-corruption’ inquisition in the first place. Clearly, the reason for this is that the US is engaging in a concerted effort to shift the international dialogue over the issue from the origins of the political crisis to the ‘normative legitimacy’ of Rousseff’s rule, strongly implying that the Color Revolution protesters have somehow invalidated her democratic and legitimate reelection and more than ‘normatively’ compensate for the shady ‘constitutional coup’ dealings that are being employed against her. At the moment, it looks like the ‘constitutional coup’-Color Revolution two-step might succeed in removing Rousseff and replacing her with Vice-President Michel Temer, who had actually been practicing his post-coup address to the nation in a recently leaked speech. Should this happen, then there wouldn’t be any reason whatsoever for the US to intensify its regime change operation into a Hybrid War by prompting an Unconventional War, but it might unwittingly happen that Rousseff’s supporters take to arms in the event that she’s overthrown. If this transpires, then the country would definitely be thrown into a low-level Hybrid War, albeit one in which this development uncharacteristically occurs after the US is successful in its mission and not beforehand, which in any case would take a course which is impossible to accurately predict at this time. However, considering just how beloved the left wing is to millions of destitute people in Brazil and taking a cue from their armed comrades in Venezuela, leftist individuals might form militias in order to protect against any forthcoming coup. Remembering the astonishing rate of crime that already exists inside of the country, it’s foreseeable that anti-coup activists/insurgents could easily procure whatever weapons they might need in order to create a destabilizing stir. Furthermore, UNASUR has hinted that it wouldn’t recognize Rousseff’s possible impeachment, which might grant an added degree of normative support to any militias that agitate on her behalf. On the other hand, if the regime change process isn’t proceeding apace around the time of the Summer Olympics in Rio and something or another happens to derail it (e.g. the Senate doesn’t vote to continue the impeachment process), then there’s a chance that the US might encourage right-wing terrorism against the government. This would seek to provoke an international incident that destabilizes the Brazilian government even more than it already is, precisely at the moment when it would need the best media coverage that it can get and when it’s most vulnerable to a flurry of unipolar media condemnation against it. Looked at from another angle, if the plot against Rousseff succeeds by that time, with or without the advent of any anti-regime change rebels, then some countries might choose to boycott the Olympics in order to show solidarity with the legitimate government that was illegally deposed of. This wouldn’t change any facts on the ground, but it would be a strong and symbolic statement of support that might encourage whatever nascent armed resistance movement there might be by that time. 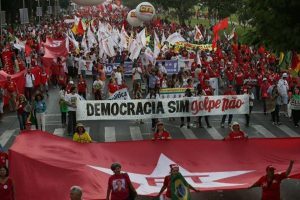 Assessing the US’ regime change strategy against Rousseff, it’s evident that the NSA’s findings were used to spark the ‘constitutional coup’ proceedings that have been ‘normatively justified’ by the preplanned Color Revolution (a continuation of the so-called “Cashmere Revolution” of 2014). The protests have thus far not led to any degree of substantial pressure on the government despite their massive size, with the only agency of tangible anti-government force coming from the ‘legal’ inquisition that’s been launched against the Brazilian President. Nothing at this point indicates that the government is threatened by the street activists, although everything points to it being totally destabilized by the “Car Wash” conspiracy against it. While no discernable Hybrid War traces can be found thus far (as in the author’s regime change definition of this concept), that doesn’t preclude any from popping up in the near future, whether led by anti-government right-wing terrorists or pro-government post-coup insurgents. There’s no guarantee that either will happen, but the possibility can’t be ruled out in general and must be prepared for by both sides. No matter what ultimately happens in Brazil, the regime change scenario currently underway there is emblematic of a new type of subversive interplay between the NSA, ‘constitutional coup’ actors, and Color Revolutionaries, and it might disturbingly foreshadow a coming trend of state-wide destabilization that could soon be rolled out elsewhere against other multipolar targets.